This afternoon we touched a bit of history. 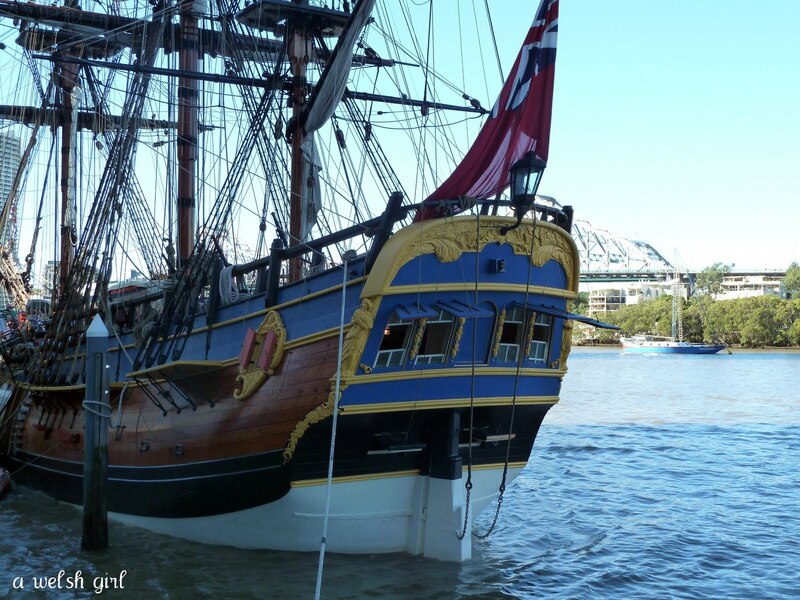 The Endeavour is currently docked in Brisbane and being a bit of a history buff I had to take a visit. Well, it's not The Endeavour obviously, but a replica that is on a circumnavigation tour of Australia. Little Sibs has been learning all about explorers at school and has just completed a project on Captain Cook's first voyage, so when I read that The Endeavour was in town it was just the place to go on a Sunday afternoon. There was a bit of a queue - well actually there was a two hour queue! Seems like it was a popular Sunday afternoon trip for a few others too! At least it was reasonably well organised and they kept us in the shade for most of the time. There were plenty of guides on board who were very happy to chat and impart their knowledge. All the kids loved hearing about the toilets on deck which essentially were holes in a piece of wood that you perched on over the sea! 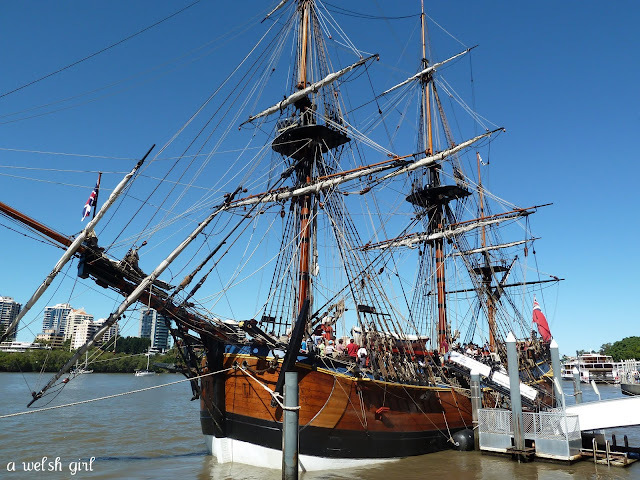 The other interesting fact was that The Endeavour had 18 miles/29km of rope on board. Can you image getting that knotted up in the storms? We then ventured down below and saw the kitchen where John Thompson the one handed Scottish cook prepared daily meals for 94 people. We passed through the area where around 60 men would live during the voyage. Each sailor had just 35.5cm in which to sling his hammock at night - it would have been pretty confined. Towards the stern of the ship the head height was only just over a metre so we all had to crouch down. This area would have been 'home' for the 8 young sailors who were midshipmen and there was also an area for the 12 marines on board. Up again to the deck where the gentlemen on board had their mess and then through to where Captain James Cook had his cabin. During Cook's first voyage (1768-1771) he shared this area with Joseph Banks and his group. the mess deck tables, Joseph Bank's desk and library, Joseph Bank's cabin, Captain Cook's cabin and uniform. It was wonderful to see the table set with the fine china in comparison to the pottery used by the majority of the sailors. Even though the officers appeared to have some luxury, it would still have been a very cramped and difficult place to spend three years. and a great experience for Sibs to bring her classroom learning to life. What a brilliant day out. The ship looks like a real version of childlike drawings I used to do as a little girl. 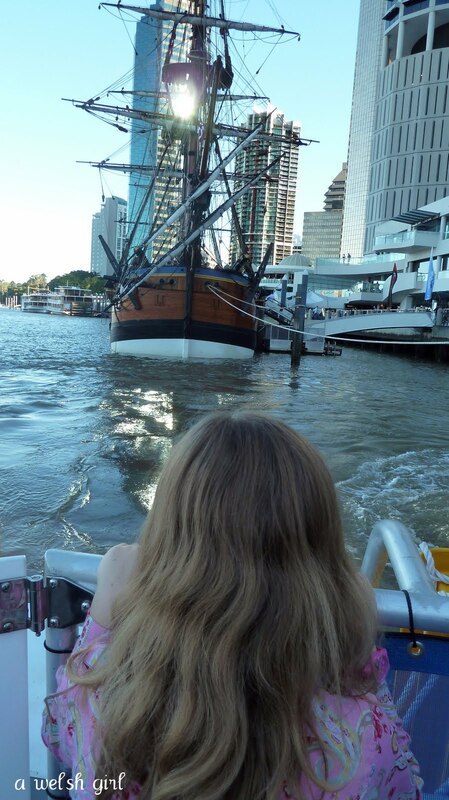 It must have been so exciting - that boat looks ennoooooooormous!! What a great way to reinforce all that she has learnt in school. It looks like she loved it! A great way to learn some history.